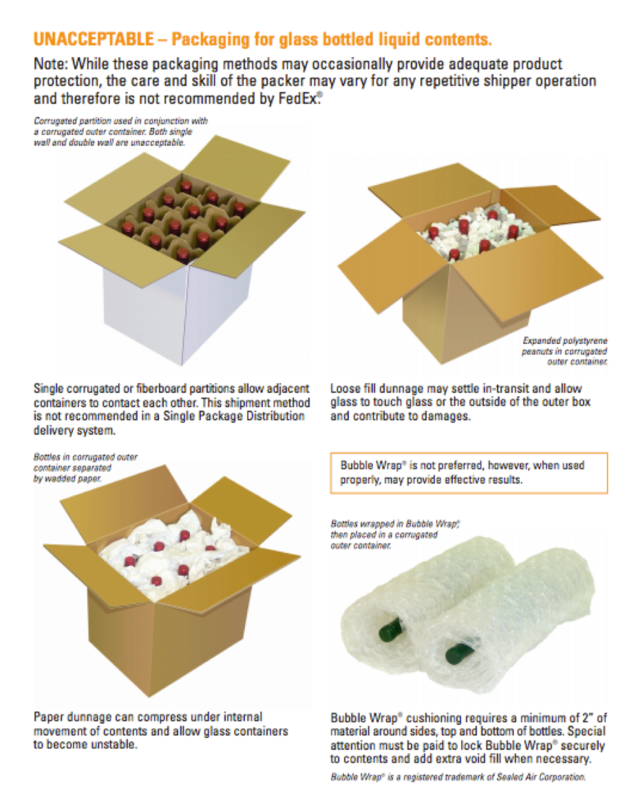 To ship wine: there are many inner packaging options available such as molded Expanded Polystyrene (EPS) foam and molded fiber trays along with inflatable wine shippers. To ship spirits: Some bottles will fit in the same packaging options for shipping wine. However, for odd-shaped or unique bottles, we recommend that you use inflatable wine shipper or do what UPS calls, the "Double (Over) Boxing Method"
For this, select an over pack box that is at least six inches longer, wider, and higher than the original box, which gives you three inches of cushion (bubble wrap or packing peanuts) to protect against vibration and damage. Please note: FedEx and UPS each require a special label signifying that the package contains alcohol. These can be obtained from the company directly.